Recognized as an innovator in endovascular surgery, Dr. James Williams provides comprehensive care for patients with various types of vascular conditions at six Cardiac Thoracic & Endovascular Therapies, S.C. locations in central Illinois. 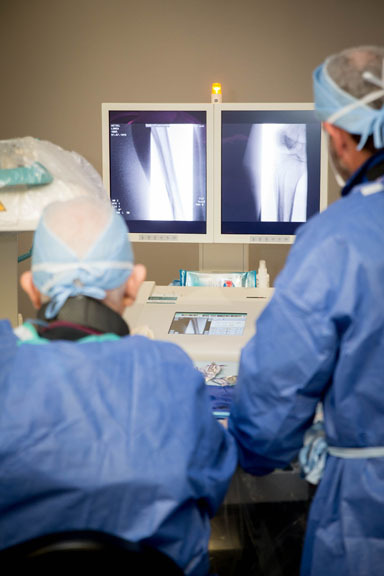 His Peoria location features a venous suite and arterial interventional suite equipped with the latest state-of-the-art technology to treat patients suffering from pain in their legs when they walk, skin ulcerations in their feet or ankles, or obstructions in their arteries. “If a patient doesn’t address these issues, [he or she] could face limb loss or persistence of symptoms,” Williams notes. Persistence of symptoms could dictate limited activity due to pain or restricted movement. “If they have to limit their activity, it could reduce their quality of life, or even shorten their life.” Recognizing the promise of relief, people come from an 80- to 120-mile radius, Williams estimates — a distance that stretches beyond the state line. One patient doesn’t have to travel far. Ronald Sauers, a 60-year-old Viet Nam veteran living in nearby Streator, IL, has had eight operations since Christmas due to blood clots in his legs. Leg pain when he walked kept him from daily activities. It’s believed that Sauers’ health issues, which include diabetic neuropathy and “a knee problem,” stem from exposure to Agent Orange during his term of service. “I’ve had several surgeries in the hospital and the office,” he relates, adding that he spent eight days in the hospital after a procedure in March, but found out his arteries were “blocked up in June again.” The risk to his life from losing a limb was so critical that aggressive repetitive treatment was chosen. Specializing in providing minimally invasive treatment of vascular disease, CTET also offers surgical treatment options for standard vascular issues, such as: arterial aneurysms, arterial insufficiency, blood clots (vena cava or veins of the leg), carotid artery disease, chronic venous insufficiency, and peripheral arterial disease. There is help for swelling, pigmentation, ulceration, and varicose veins. Treatment options available in CTET’s arterial intervention suite include endovascular diagnostic angiography, balloon angioplasty stenting and atherectomay of arteries, balloon angioplasty and stenting of veins, ablation therapy of varicose and incompetent veins, and placement of inferior vena cava filters. But what Williams is particularly proud of is a new method of arterial intervention. 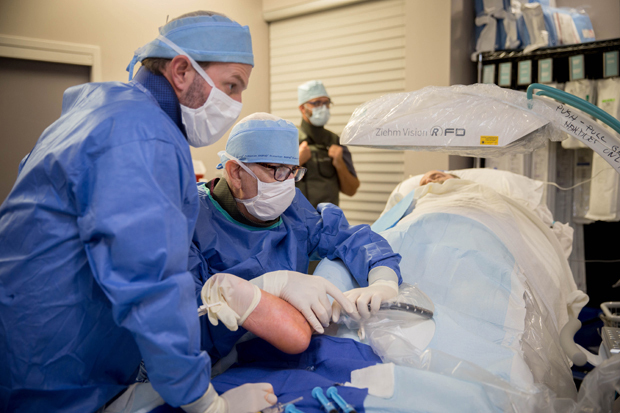 “When a patient has a new obstruction in their arteries, we can now approach it from the foot instead of the groin,” Williams explains. 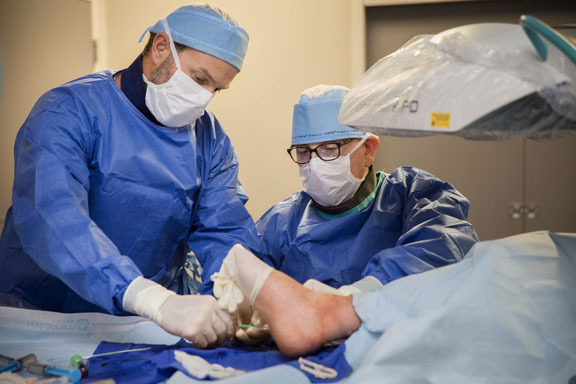 Technically referred to as retrograde tibiopedal access for critical limb ischemia, this procedure is often able to salvage lower extremity limbs. “It does a better job getting blood flow to lower limbs and reduces limb loss,” Williams elaborates. One advantage of this new angle of access is a much lower rate of complication. Another is a much higher success rate. An additional benefit is that with this process, about 50 percent less dye (contrast) is administered, which has less impact on the kidneys. The procedure is well-suited for patients who are heavyset or cannot lie flat. More than half of the arterial interventions he does are through the foot. All the procedures done at CTET are low-risk procedures that can be done in the office, Williams says, performed while the patient is under conscious sedation with a local anesthesia. “We’re able to do things in the office that, until two years ago, were only done in the hospital.” Patients like that for many reasons. They’re familiar with the office and staff. As Sauers mentioned, admission, treatment, recovery, and discharge are all within a few feet of each other. There’s close parking for easy accessibility. Fasting before procedures is not required, a definite advantage for diabetics, in particular. Other medical benefits are less bruising and less recovery time. After approximately 30 minutes of prep, the procedure takes 30 to 60 minutes, and is followed by one hour in the three-bed recovery bay. State-of-the-art imaging equipment also shortens the examination time. Although the procedures are streamlined, Williams emphasizes that patients are treated the same way as in the hospital from a medical standpoint. “We’re like a mini-hospital, but in a more intimate setting.” Most patients report less stress from having less invasive procedures done in the office. “Feedback is very good,” Williams says. “We make it patient-centered and patient-friendly. It’s more personalized here.” The entire staff considers the comfort and care of each patient a top priority. Since the office was opened in 2003, the staff at CTET has worked as a team to provide the best individualized care to all their patients. Leading the team, Dr. Williams earned his medical degree from Baylor College of Medicine in Houston, Texas. He completed his surgical residency at the University of Alabama Hospital/Clinics in Birmingham, and his cardiothoracic surgical residency at the Hospital of the University of Pennsylvania and Children’s Hospital of Philadelphia. Board-certified in three surgical specialties — cardiothoracic, vascular, and general — he is a Fellow of the American College of Surgeons, and a member of the International Society of Endovascular Specialists. Williams is president and sole owner of CTET, which is only the second facility in the state to perform some of the procedures he’s doing in the office. Williams is assisted by full-time registered nurse Janet Winkler, who is also the clinical coordinator for the practice. 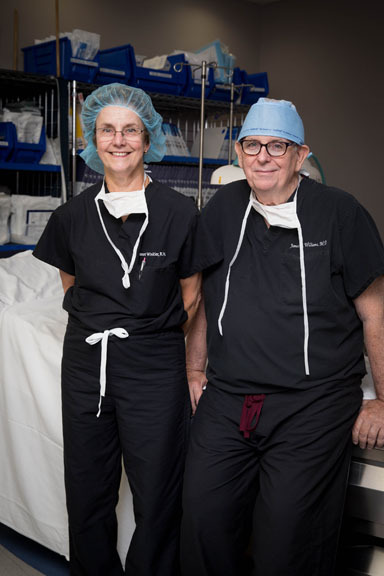 Williams and Winkler met when both worked at Jefferson Memorial Hospital in St. Louis, where he established the Cardiac Surgery Program. Debra Hawley with 30 years experience coordinates/navigates the mucky waters of insurance/reimbursement. Ashley Wood and Jennifer Phipps, full-time schedulers, travel with Williams and Winkler to the satellite clinics to help with front desk duties and patient services. The three satellite clinics are located in Peru, Princeton, and Streator, where patients are seen twice monthly. In addition, Williams holds privileges at several hospitals, where he continues to perform surgery and other procedures. Cassandra Koehler works as the inventory specialist, and Amy Wyrick is the receptionist. Three part-time RAD techs and three RNs assist with arterial procedures in the Peoria office. Sami Williams was involved in the start up and building of the office-based lab and is now overseeing its daily operations. Trudy Trobaugh, a retired nurse, has a long history of vascular disease. Twenty-six years ago, she had an invasive procedure done at a hospital to address blockages in her aorta that resulted in blood clots in her left leg. Complications led to a below-the-knee amputation. 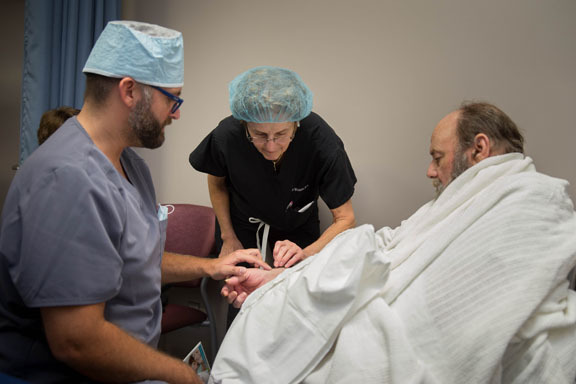 He believes the increased demand for arterial intervention is due to the convenience and comfort of having the procedure done in an office setting rather than the hospital, as well as to the desire to keep all their limbs functioning properly. “Body image is so important.” So is health and well-being, and the ability to get around without pain.